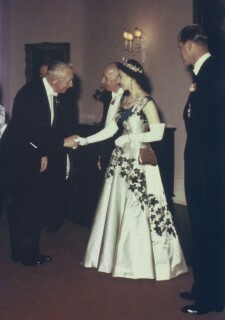 On her first official visit as Queen of Canada and Head of State, Her Majesty wore the “Maple Leaf of Canada dress” to a state banquet and reception at Rideau Hall. The Queen spent four days in Ottawa, and officially opened the first session of the 23rd Parliament of Canada. © Canadian Museum of Civilization, 2012. Photo: Eleanor Oulton Griffin. The Canadian Museum of Civilization was once known for avoiding controversy at any cost. An exhibition some years ago on the history of Acadians, for example, failed to mention they had all been expelled from Canada in the period 1755-63. That, frankly, was a shocking whitewash of history. Over the years, the museum has slowly been taking steps to tell more complete versions of our history. And thus, we come to the new exhibition opening July 1 marking the Queen’s Diamond Jubilee as monarch, in which the museum has bravely shown, through old news photos and political cartoons, that Her Majesty is not universally loved in this country. Of special interest is an information panel on Truncheon Saturday, which occurred Oct. 10, 1964, in Quebec City when police brutally attacked demonstrators protesting the Queen’s visit to the provincial capital.